After Mark had read his card and the news had sunk in some, he was still grinning like a fool. Timidly, I asked him, “Are you happy about this?” He looked shocked that I had asked such a question. I didn’t know that I had insulted him. I didn’t realize he would be so happy that we had created something together out of our love. By asking the happiness question, I had questioned his love for me. Once we had established that we were both happy to be having a baby it was time to spread the news. Once I had given my parents time to get home, I called them first. I had to track them down at my grandmother’s house. When I told my mom, she didn’t believe me at first. They were just here and she hadn’t seen me sick or otherwise pregnant-like. Besides, if I just found out, wouldn’t I have told them before they left to go home? Sorry about that Mom, but I had to tell Mark first. I think we called my mother-in-law next, then my father-in-law. We stopped after those, deciding to wait until we knew more—like a due date. I didn’t have a doctor yet. I hadn’t planned on trying to have a baby for another nine months, let alone to actually be pregnant already. I knew I could get any number of recommendations in Texas, but I didn’t live there anymore so that was useless. What to do? What to do? I decided to try a pregnancy center I had seen on my way to grocery shop. I figured they could at least point me in the right direction. A nice lady talked to me for a little while, had me pee in a cup and predicted my due date with one of those wheels (girls you know what I’m talking about). Then she wanted to pray with me. Whoa. Back up a minute. I have nothing against prayer, but I was under the impression that this place was to help pregnant women, you know, like medical—not spiritual. I kept this thought to myself, but I was a little apprehensive at this point. It wouldn’t be until I started getting calls at home that I realized the place was a Christian based Pregnancy Crisis Center. They were used to counseling women that didn’t want their babies or girls kicked out of their homes for being pregnant. Oooops! Time for another approach. Working in an environment with small kids has its advantages. Many of these small kids were recent big brother/sisters or on their way to becoming one. Expectant mothers of these small kids pick them up in the afternoon and literally bump into me. I hadn’t been working very long at the school by then, but I had worked in one class more than any other. One of the moms was due in a few weeks. I asked her where she went for her prenatal care and she mentioned a group practice. I went home and looked them up on our insurance, then gave them a call. I scheduled my very first prenatal appointment for the following month (July). I already had three positive tests so they knew I was pregnant. There was no need to go in any earlier. Our life continued very much like it did before I found out we were going to have a baby. I continued to work part-time at the Special Children’s School and Mark continued working nights. There was still no sign of morning sickness and I felt great most of the time. My appetite had increased, but I did have one aversion. Sweets made me feel ill. Not throwing-up-sick, but just blah. I loved Little Debbie snacks, but I could no longer tolerate them. The brownies, oatmeal pies and other assorted goodies of my childhood were no longer appealing. Energy wise I was fine too. I never felt the fatigue I had read as a symptom. I felt really revved most of the time. I guess maybe I was riding on an emotional high. I was so happy to be having a baby even though it didn’t seem real yet. Every morning I got up and thought, “Hey, I’m knocked up!” Or something like that. Since Mark worked at night, he was able to make almost all of my doctor appointments. We went to the first one sometime in early July. The practice had four doctors and three midwives. All of them could do prenatal visits, but only the physicians could deliver. Mark waited out in the waiting room while I talked to a midwife. I didn’t know if they would be doing an exam or what. She got my background and then asked how far along I was. I didn’t know but guessed about eight or nine weeks. The midwife thought we might be able to hear the heartbeat and got out the Doppler. Right away she found the swish-swish sound of the baby. I was immediately enthralled. Suddenly it was all real! I told her that my husband just had to hear this. She went out and brought Mark back with her. Together we listened to our baby for the first time. Because I hadn’t been paying very close attention to my body and because I was on birth control, our actual due date was somewhat of a mystery. It was kind of decided that February 12th was a good date. For one, my favorite number is 12 and for another, I thought maybe I would go late and the baby would be born on Mark’s birthday. Medical professionals like to be precise though so it was decided I should have an ultrasound on my next visit to date the baby. That was okay by me. It would be too early to tell the gender and Mark and I had differing thoughts on that. I wanted the baby to be a surprise and Mark was in favor of finding out what we were having. A month later we returned for our appointment and the ultrasound. Boy was that a shocker. Unless you’ve been there, you probably think all prenatal ultrasounds are on the tummy. Correct? Um, no. They are not all on the tummy. Some are, in fact, vaginal. Yep. I said it. Vag-i-nal. Nevertheless, I endured the rather humiliating experience so we could see our sweet baby. What amazed me was how completely developed our little human was. He/she looked like a real baby already. He/she even waved at us. I most definitely had not felt the baby move yet, but here he/she was twisting and kicking and showing off. 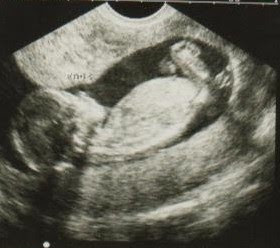 The technician asked, “How far along are you?” I said, “I think 12 weeks, but we’re not sure.” Then she replied, “Well according to this, you are 14 weeks and 4 days.” Ooops, again. Guess I really should have paid more attention. We now had a new due date: January 29, 2001. For a few more weeks our life was routine. Mark was putting in long hours at his job. He had been promoted back in March and he was determined to prove himself, especially now that we had a little one on the way. He was working up to 12-16 hours a day and had a 3 hour commute round-trip so he wasn’t home very much. I was enjoying working at the school, even though I was still only part-time. What made it even better was the number of pregnant co-workers. By the end of 2000 there would be nine of us expecting, a full 1/5 of employees. Jokingly, we started cautioning everyone about drinking the water. I had also found a fantastic online community of expectant moms. It was amazing to connect with women all around the world going through the same experience. I was relieved that we were able to get through our previous ultrasound without the gender being revealed. I didn’t think it really mattered anyway since I just knew we were having a boy. Mark is one of three boys. His paternal grandparents had nine kids, eight boys and one girl (and she was next to last). I knew fathers determined gender. Besides, I read once that the greater the age difference between a man and a woman, the greater their chance of conceiving male offspring. With family history and Mark being twelve years older than me, the odds of us having a girl were slim to none. I had all of this on my mind when we went for a check-up at twenty-two weeks.